Think constructing a building on a college campus is simply a matter of snatching state funding, hiring the lowest-bid design and construction team and moving in faculty, staff and students? Putting up the $165.5 million, 237,000-square-foot Sandler Neurosciences Center on the University of California, San Francisco’s Mission Bay campus was anything but simple to arrange. The end product, however, is a stunning testimony to public-private partnerships and, potentially, scientific collaboration. 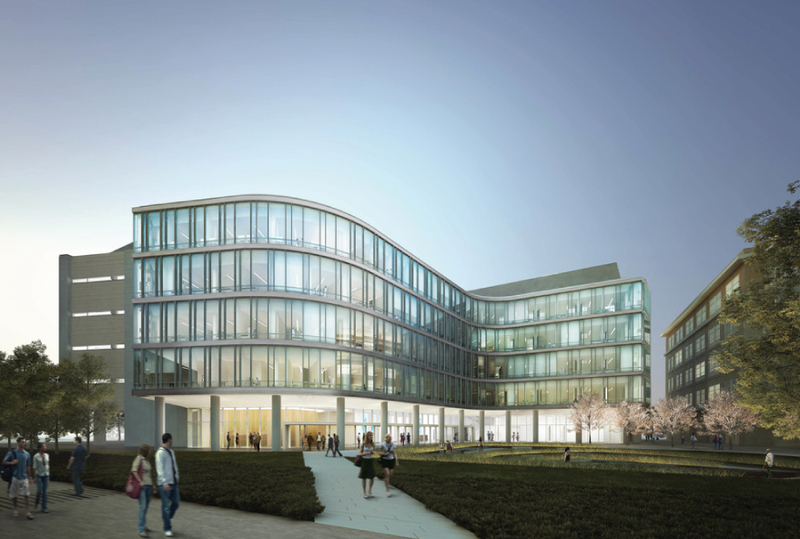 The project leapfrogged over others atop UCSF neuroscience researchers sought to move their labs on UCSF’s Parnassus Avenue campus to a leased, off-campus site in Mission Bay. College officials, staring at a long-term lease and little control over the space jumped in. The problem was in how to finance a campus building without interrupting the flow of other Mission Bay projects as the recession gripped the country and the state watched its pennies. The solution was a unique arrangement between UCSF, a private developer, a building management company and a little-known state agency. UCSF owns the land but leases it to a nonprofit group that subleases it to Edgemoor/McCarthy Cook, a partnership between Clark Construction Group’s Edgemoor subsidiary and property management firm McCarthy Cook & Co. That team constructed the building and is leasing it to UCSF for 38 years, after which UCSF takes ownership. The California Infrastructure and Economic Development Bank, or I-Bank, sold some $200 million in bonds for construction. The arrangement helped shape the building – with its curved façade and floating staircase in the center of its atrium – into a Mission Bay jewel. “We made a lot of decisions that may not have been the cheapest decisions, but for long-term energy efficiency and maintenance and cost-effective maintenance and workflow, we think it’s a superior way of designing and ultimately building projects,” said Steve Dell-Orto, senior vice president and general executive officer for Clark Construction’s Northern California and Pacific Northwest division. The project broke ground in April 2010 and researchers started moving in two years later. But as stunning as the structure appears to visitors and as functional as it is for neuroscience researchers and patients as well, its open design is meant to encourage collaboration between scientists and clinicians. “It allows people to go from floor to floor and co-mingle instead of restricting the flow,” Dell-Orto said. Among the roughly 100 principal investigators housed in the facility are Nobel laureate Stanly Prusiner, neuroscience imaging expert Adam Gazzaley and Stephen Hauser, chair of UCSF’s Department of Neurology. The foundation of Bay Area banking veterans Herbert and Marion Sandler issued a $20 million challenge gift in May 2012 to support research in the building. In all, the building houses about 600 people. Balancing the needs of researchers, clinicians and patients with building codes for biotech space was a lot like putting a Rubik’s Cube together, Dell-Orto said, but Clark, Edgemoor, McCarthy Cook and lead architect Skidmore, Owings & Merrill LLP worked with academics to resolve issues. “Everybody worked together very nicely, “Dell-Orto said.